The Phillies added three former BlueClaws to their 40-man roster on Tuesday. 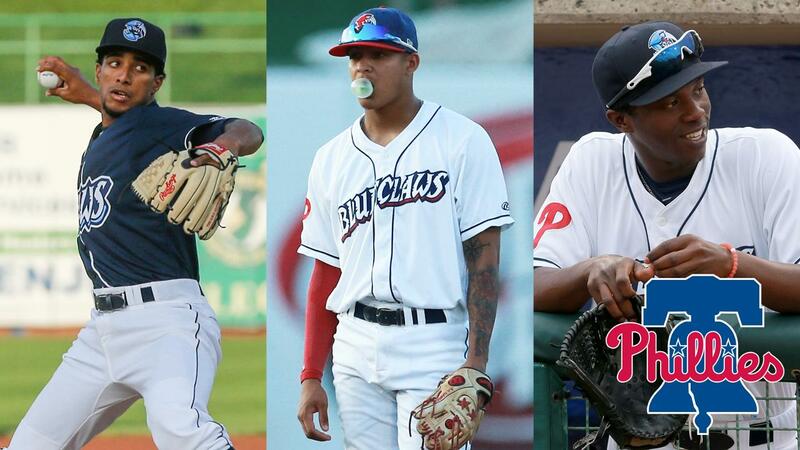 Three former BlueClaws - pitchers Adonis Medina and Edgar Garcia along with shortstop Arquimedes Gamboa - were added to the Phillies 40-man roster on Tuesday. Medina, 21, spent 2017 with the BlueClaws where he went 4-9 with a 3.01 ERA. He struck out 133 hitters in 119 innings over 22 starts with Lakewood. He then spent this year with Clearwater, going 10-4 with a 4.12 ERA. Medina was also selected to pitch for the World All-Stars in the MLB Futures Game in July. He is the #3 prospect in the system per MLB Pipeline. Garica, 22, made 27 appearances with Lakewood in 2016, going 4-1 with a 2.80 ERA, adding 59 strikeouts in 61 innings of work. After pitching for Clearwater in 2017, he spent the bulk of 2017 with Reading, going 7-2 with a 3.32 ERA with 68 strikeouts in 59 innings pitched. Garcia was also selected to the Eastern League All-Star team this year. Gamboa, 21, spent 2017 in Lakewood, hitting .261 with six home runs and eight stolen bases. He finished the season hitting safely in his last 14 games. This year, he hit .214 with Clearwater and led all Florida State League shortstops with a .971 fielding percentage. He was the starting shortstop for the Northern Division in the FSL All-Star Game. Gamboa is the #11 prospect in the system per MLB Pipeline.